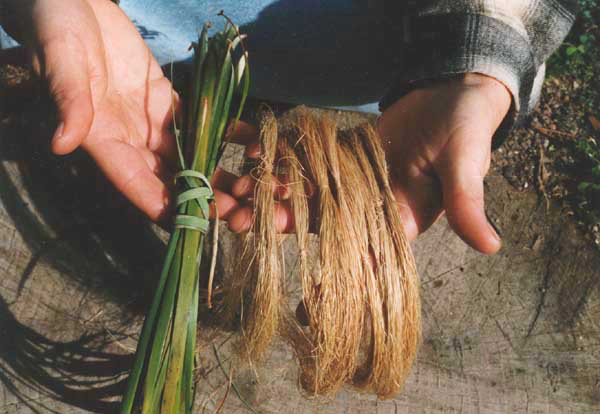 The leaves of a few species of wild Irises in Northern California and Southwestern Oregon contain fibers that can be used to make cordage and were a staple fiber in aboriginal technologies of the Northern California Coastal Region. The main species listed is usually Iris macrosiphon. Iris purdyi is also said to have been used, but it is or was a subspecies of macrosiphon anyway. We have also used a shorter leaved Iris in Southern Oregon near Ashland, which we remember as being Iris tenax (tenax = tough), but we cannot remember if we actually keyed it out or not. The flower color of Irises can vary a lot even among one species and they hybridize freely with each other in the wild. For instance, Munz's A California Flora lists four wild Iris species that can cross with Iris macrosiphon, and even one hybrid of macrosiphon with two others! It is altogether common to find different colored Iris flowers on plants that appear to be in the same clump and look identical in all other respects. These traits of free hybridization and motley flower color have allowed the development of some remarkably beautiful native Iris hybrids by plant breeders. However, the wild Iris species are quite comely, even in the absence of artificial breeding, and need little introduction to anyone who knows what the domesticated Irises look like; they are simply smaller. Munz lists the range of Iris macrosiphon as Santa Clara to Glenn and Tehama counties (latitude of Eureka). And Tuolumne (Stockton) to Butte counties. The Useful Irises common here in inland Mendocino County are somewhat low to the ground and are commonly called Ground Iris. We believe that they are Iris macrosiphon. We take a pretty practical approach to botany, and simply use the ones that look right and that we know work well from experience. The flowers of the useful Ground Irises vary in color from white to yellow to purple. In spring the new leaves are upright and lighter green. The narrow and somewhat fleshy mature leaves arc up at a gentle angle and back down, with the tips often touching the ground. 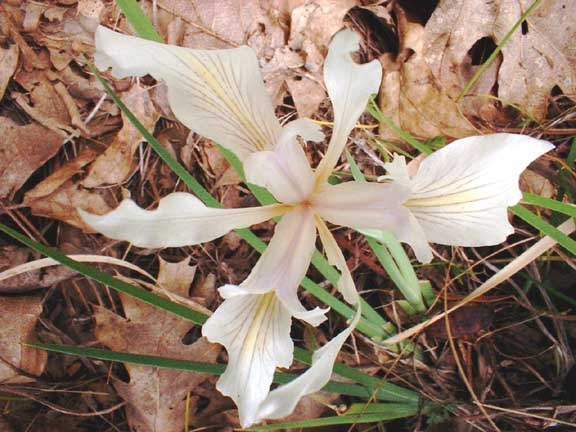 This low arching growth habit gives the cluster of leaves a prostrate drooping or spreading appearance and is probably responsible for the common name, Ground Iris. When observed in the summer, it may be hard to believe that these few small shabby looking leaves can support the production of such a magnificent florescence each year, but obviously the Iris know what they are doing. Contrast the growth habit of the Ground Iris to the upright types like Iris douglasiana (Douglas Iris) and Iris missouriensis, which have broader, proportionally thinner and more brittle leaves, and do not seem to contain much in the way of useable fibers. There are references suggesting the use of Iris douglasiana for fiber, but we have never found any of these larger broad leaved varieties to be very useful. Iris Macrosiphon tends to grow in dryish areas, often in or on the edges of hardwood or mixed forest, but frequently in grassy areas as well. They can tolerate pretty much full shade, or be right out in the open, but a gentle mix of the two seems to be a favored habitat. Ground Iris often seem to be associated with Oak woodlands. Each Iris leaf contains only two thin fibers! However, these fibers are very strong and were favored in aboriginal California for making fish nets, deer snares and other items. The fiber, being from a monocot (plants with a single seed leaf) is of the "hard" type and is mono-filament-like. Harvesting and processing enough Iris to construct a net or rope is a sizable undertaking and processing just a little is sure to impart a great deal of respect for the people who undertook such projects in the old days, or still undertake them today. The fact that Ground Iris was more favored for some uses in areas where the excellent and much more easily processed fiber plant Dogbane (Apocynum cannabinum) also occurs, must certainly be considered a testament to some very useful qualities of its fiber. Whether these desirable qualities are tensile strength, wear resistance, rot resistance or something else can only by ascertained with real certainty by using objects made from these fibers on a regular basis. First, split the leaf into two by running your fingernail down the middle from the center to each end. Grasp one of the halves with your thumbnail in the center. Tear the waste part of the leaf against the nail until basically only the fiber on the outside edge is holding the piece together. Scrape your fingernail along the fiber toward one end. The bulk of the leaf should peel away leaving the single fiber. Leaves of the Iris to be used for fiber are gathered after the fiber in the leaf matures and hardens off. The harvest season is from late summer through the fall and can extend into the winter. The tips are often sere (browned) at time of harvest. Many leaves must be gathered to yield any appreciable amount of fiber, but, if harvested properly, the plant is not hurt in any way. Harvest the few largest and healthiest mature leaves from each plant. Grasp one leaf at a time, and pull it straight out of the cluster. It will almost invariably pull right out, leaving the rhizomes and roots intact. Once in a while, a section of the rhizome will break off with the leaf; if so, trim off the leaves to a couple inches long and replant, or take it home and pot it up. If you are harvesting only the longest healthiest leaves, you will generally find yourself leaving the majority to the plants. If you should happen to run into a super healthy patch with mostly nice leaves, harvesting about 1/3rd of the total blades from any given cluster should be an adequate rule of thumb for compromising between your needs and the needs of the plant. A clump of Iris gives the impression of being a fairly permanent fixture carrying on the slow measured animation of growth flush, flower, mature seed, wait for rain, wait for warmth, grow, flower.... and if not abused will most likely continue to do so. Strip the other half of the fiber similarly. Wrap each small handful gathered with an Iris leaf to form a bundle. Although it is necessary to wilt the leaves slightly before processing, care must be taken that the leaves do not dry out too much. The essential step of slightly wilting the leaves makes it possible to efficiently remove the fiber without breaking it. If the leaves progress past "wilted" to "too dry", the fibers will again begin to break during processing. You may note in the account below that it says leaves can be rewetted if they dry out. We have not had much luck reconstituting completely dry leaves and think that this expedient probably only applies to leaves which are too dry but not dried all the way out. The leaf blades can be kept in a workable state in a plastic bag or damp cloth for quite a while, but there is only so much room for procrastination. Working time can be considerably extended by bagging the fresh leaves up immediately and refrigerating them, then pulling out a bundle to wilt and work on now and again. Like so many processes involving natural materials, once you start you are on the materials time. You must have a thumbnail, real or artificial, to process Iris. If you are right handed it will be your right thumbnail. Some Indian groups use a piece of mussel shell tied to the thumb. For now, just use your thumbnail and once you sit down and process a good quantity of the fiber, you will see why the artificial nail was developed. Always work from the approximate center of the leaf or fiber outwards. Don't just follow the steps and concentrate on your head and eyes. Feel the details with your fingers. They are much more important. When you get this process down, you can do it with your eyes closed because the tactile information from your fingers is much more important than the visual information. Don't catch the fiber with the skin of your thumb, or pinch it too hard between thumbnail and forefinger while stripping, or it will break. Tearing the waste part of the leaf down to the fiber in order to begin scraping, without breaking the fiber itself, is the most difficult part of the process. This task can be accomplished as mentioned above by gently tearing the leaf, but with practice it becomes a kind of integral twist of the wrist and nail. Resist the temptation to peel or split away the waste part of the leaf from the fiber. The fiber will "run out" and break off short. It must be scraped or "bulldozed" off with the thumbnail. Be sure to wilt the leaves adequately, but not too much. Harvest the right kind of Iris. Not all species work! Harvest in the appropriate season- Late summer thru fall. Place one half of the leaf between two fingers of your right hand while you work on the first half. If you do this the same way each time, you won't have to look to try and see which side has the fiber on it. You will find that this detail makes it easier to start the scrape and is a great advantage to your work flow. (hopefully to be published soon). "The string regularly used for nets, bags, snares, and the like was made exclusively from the leaf of Iris macrosiphon. This is a small plant with a white flower. Each leaf yielded only two fine, white, silky fibers. These were extracted by the women with the aid of an artificial thumbnail of mussel shell...."
"The leaves of this Iris macrosiphon are from one to two feet in length and not over a quarter of an inch in width, and are flat almost to the root. They are a red purple at the base, white a little farther up, and finally green throughout the remainder of that part of their length which is above ground and in the light. With the leaves held in the left hand, each leaf is split by means of the artificial nail on the right thumb. Then each half leaf is stripped of its green pulpy material by drawing this shell thumbnail from the middle of the half leaf out, first toward one end, then toward the other, on one side, then the leaf is turned over. Thus with four such strippings one leaf is reduced to its two, full-length, silken, white fibers." "The fibers of the common large species Iris missouriensis (chir apkas), lack the tensile strength and are not used." After gathering... " On arrival at camp or home, these bundles are hung up overnight, but not where smoke will reach them. This procedure is necessary to permit the two contained fibers to be extracted without breaking as they are peeled out." "The next day the bundles are opened and each leaf is split with the thumbnail from its distal end, the index finger following through in the split after it is started. Each half-leaf is then scraped by being passed between the end of the middle finger and the musselshell scraper which is fitted over the thumb to form a false thumbnail. (footnote: The edge of this implement is sharpened with the stem of the giant Equisetum.) If bundles dry before they can be scraped, they are dipped in water and laid in a basket until next day when they will be sufficiently damp and pliable to be split and scraped." "Sometimes the leaves are scraped directly over the sharp edge of a musselshell spoon instead of by means of the thumb scraper." "Rope (tcek) of iris (tutiri), milkweed (koroti) or occasionally indian hemp (bok). Iris most common.... ....Fish lines preferably of Iris." "A rope maker would lend a hunter a loptci (a raw coil of iris fiber rope) of standard length (about 15 feet), used to make a snare. If the hunter were successful he returned the rope with a portion of the deer meat or even with the hide. A deer hide, however, was often equivalent of the direct purchase of a loptci. In other words, the rope owner expected a compensation commensurate with that of the men who had participated in the hunt." Note from the authors: Having tanned bushels of deer hides, the reference pertaining to the cost of an Iris fiber rope must refer to a tanned skin not a raw one. Even so, and knowing the considerable work it takes to tan a deer skin, it would seem to us that trading a tanned deer skin for an iris fiber rope would be quite a bargain.